Synthetic Biology Research at NASA Ames. Synthetic biology is an interdisciplinary branch of biology and engineering. The subject combines disciplines from within these domains, such as biotechnology, genetic engineering, molecular biology, molecular engineering, systems biology, membrane science, biophysics, chemical and biological engineering, electrical and computer engineering, control engineering and evolutionary biology. Synthetic biology applies these disciplines to build artificial biological systems for research, engineering and medical applications. Synthetic biology is seen differently by biologists and engineers. Originally seen as part of biology, in recent years the role of electrical and chemical engineering has become more important. For example, one description designates synthetic biology as "an emerging discipline that uses engineering principles to design and assemble biological components". Another portrayed it as "a new emerging scientific field where ICT, biotechnology and nanotechnology meet and strengthen each other". A ribosome is a biological machine. "designing and constructing biological modules, biological systems, and biological machines or, re-design of existing biological systems for useful purposes". The functional aspects of this definition are rooted in molecular biology and biotechnology. As usage of the term has expanded, synthetic biology was recently defined as the artificial design and engineering of biological systems and living organisms for purposes of improving applications for industry or biological research. In general its purpose can be described as the design and construction of novel artificial biological pathways, organisms or devices, or the redesign of existing natural biological systems. Synthetic biology has traditionally been divided into two different approaches. Top down synthetic biology involves using metabolic and genetic engineering techniques to impart new functions to living cells. Bottom up synthetic biology involves creating new biological systems in vitro by bringing together 'non-living' biomolecular components, often with the aim of constructing an artificial cell. Biological systems are thus assembled module-by-module. Cell-free protein expression systems are often employed, as are membrane-based molecular machinery. There are increasing efforts to bridge the divide between these approaches by forming hybrid living/synthetic cells, and engineering communication between living and synthetic cell populations. The first identifiable use of the term "synthetic biology" was in Stéphane Leduc’s publication of Théorie physico-chimique de la vie et générations spontanées (1910) and his La Biologie Synthétique (1912). A contemporary interpretation of synthetic biology was given by Polish geneticist Wacław Szybalski in a panel discussion during Eighteenth Annual "OHOLO" Biological Conference on Strategies for the Control of Gene Expression in 1973 Zichron Yaakov, Israel. The work on restriction nucleases not only permits us easily to construct recombinant DNA molecules and to analyze individual genes, but also has led us into the new era of synthetic biology where not only existing genes are described and analyzed but also new gene arrangements can be constructed and evaluated. A notable advance in synthetic biology occurred in 2000, when two articles in Nature discussed the creation of synthetic biological circuit devices of a genetic toggle switch and a biological clock by combining genes within E. coli cells. In April 2019, scientists at ETH Zurich reported the creation of the world's first bacterial genome, named Caulobacter ethensis-2.0, made entirely by a computer, although a related viable form of C. ethensis-2.0 does not yet exist. Engineers view biology as a technology – a given system's biotechnology or its biological engineering. Synthetic biology includes the broad redefinition and expansion of biotechnology, with the ultimate goals of being able to design and build engineered biological systems that process information, manipulate chemicals, fabricate materials and structures, produce energy, provide food, and maintain and enhance human health (see Biomedical Engineering) and our environment. Studies in synthetic biology can be subdivided into broad classifications according to the approach they take to the problem at hand: standardization of biological parts, biomolecular engineering, genome engineering. Biomolecular engineering includes approaches that aim to create a toolkit of functional units that can be introduced to present new technological functions in living cells. Genetic engineering includes approaches to construct synthetic chromosomes for whole or minimal organisms. Biomolecular design refers to the general idea of de novo design and additive combination of biomolecular components. Each of these approaches share a similar task: to develop a more synthetic entity at a higher level of complexity by inventively manipulating a simpler part at the preceding level. On the other hand, "re-writers" are synthetic biologists interested in testing the irreducibility of biological systems. Due to the complexity of natural biological systems, it would be simpler to rebuild the natural systems of interest from the ground up; In order to provide engineered surrogates that are easier to comprehend, control and manipulate. Re-writers draw inspiration from refactoring, a process sometimes used to improve computer software. Several novel enabling technologies were critical to the success of synthetic biology. Concepts include standardization of biological parts and hierarchical abstraction to permit using those parts in synthetic systems. Basic technologies include reading and writing DNA (sequencing and fabrication). Measurements under multiple conditions are needed for accurate modeling and computer-aided-design (CAD). Driven by dramatic decreases in costs of oligonucleotide ("oligos") synthesis, the sizes of DNA constructions from oligos have increased to the genomic level. In 2000, researchers reported synthesis of the 9.6 kbp (kilo bp) Hepatitis C virus genome from chemically synthesized 60 to 80-mers. In 2002 researchers at SUNY Stony Brook succeeded in synthesizing the 7741 bp poliovirus genome from its published sequence, producing the second synthetic genome, spanning two years. In 2003 the 5386 bp genome of the bacteriophage Phi X 174 was assembled in about two weeks. In 2006, the same team, at the J. Craig Venter Institute, constructed and patented a synthetic genome of a novel minimal bacterium, Mycoplasma laboratorium and were working on getting it functioning in a living cell. In 2007 it was reported that several companies were offering synthesis of genetic sequences up to 2000 base pairs (bp) long, for a price of about $1 per bp and a turnaround time of less than two weeks. Oligonucleotides harvested from a photolithographic- or inkjet-manufactured DNA chip combined with DNA mismatch error-correction allows inexpensive large-scale changes of codons in genetic systems to improve gene expression or incorporate novel amino-acids (see George M. Church's and Anthony Forster's synthetic cell projects.) This favors a synthesis-from-scratch approach. Additionally, the CRISPR/Cas system has emerged as a promising technique for gene editing. It was described as "the most important innovation in the synthetic biology space in nearly 30 years". While other methods take months or years to edit gene sequences, CRISPR speeds that time up to weeks. Due to its ease of use and accessibility, however, it has raised ethical concerns, especially surrounding its use in biohacking. DNA sequencing determines the order of nucleotide bases in a DNA molecule. Synthetic biologists use DNA sequencing in their work in several ways. First, large-scale genome sequencing efforts continue to provide information on naturally occurring organisms. This information provides a rich substrate from which synthetic biologists can construct parts and devices. Second, sequencing can verify that the fabricated system is as intended. Third, fast, cheap, and reliable sequencing can facilitate rapid detection and identification of synthetic systems and organisms. Microfluidics, in particular droplet microfluidics, is an emerging tool used to construct new components, and to analyse and characterize them. It is widely employed in screening assays. While DNA is most important for information storage, a large fraction of the cell's activities are carried out by proteins. Tools can send proteins to specific regions of the cell and to link different proteins together. The interaction strength between protein partners should be tunable between a lifetime of seconds (desirable for dynamic signaling events) up to an irreversible interaction (desirable for device stability or resilient to harsh conditions). Interactions such as coiled coils, SH3 domain-peptide binding or SpyTag/SpyCatcher offer such control. In addition it is necessary to regulate protein-protein interactions in cells, such as with light (using light-oxygen-voltage-sensing domains) or cell-permeable small molecules by chemically induced dimerization. In a living cell, molecular motifs are embedded in a bigger network with upstream and downstream components. These components may alter the signalling capability of the modeling module. In the case of ultrasensitive modules, the sensitivity contribution of a module can differ from the sensitivity that the module sustains in isolation. Studies have considered the components of the DNA transcription mechanism. One desire of scientists creating synthetic biological circuits is to be able to control the transcription of synthetic DNA in prokaryotes and eukaryotes. One study tested the adjustability of synthetic transcription factors (sTFs) in areas of transcription output and cooperative ability among multiple transcription factor complexes. Researchers were able to mutate zinc fingers, the DNA specific component of sTFs, to decrease their affinity for specific operator DNA sequence sites, and thus decrease the associated site-specific activity of the sTF (usually transcriptional regulation). They further used the zinc fingers as components of complex-forming sTFs, which are the eukaryotic translation mechanisms. A biological computer refers to an engineered biological system that can perform computer-like operations, which is a dominant paradigm in synthetic biology. Researchers built and characterized a variety of logic gates in a number of organisms, and demonstrated both analog and digital computation in living cells. They demonstrated that bacteria can be engineered to perform both analog and/or digital computation. In human cells research demonstrated a universal logic evaluator that operates in mammalian cells in 2007. Subsequently, researchers utilized this paradigm to demonstrate a proof-of-concept therapy that uses biological digital computation to detect and kill human cancer cells in 2011. Another group of researchers demonstrated in 2016 that principles of computer engineering, can be used to automate digital circuit design in bacterial cells. In 2017, researchers demonstrated the 'Boolean logic and arithmetic through DNA excision' (BLADE) system to engineer digital computation in human cells. A biosensor refers to an engineered organism, usually a bacterium,that is capable of reporting some ambient phenomenon such as the presence of heavy metals or toxins. One such system is the Lux operon of Aliivibrio fischeri, which codes for the enzyme that is the source of bacterial bioluminescence, and can be placed after a respondent promoter to express the luminescence genes in response to a specific environmental stimulus. One such sensor created consisted of a bioluminescent bacterial coating on a photosensitive computer chip to detect certain petroleum pollutants. When the bacteria sense the pollutant, they luminesce. Modified organisms can sense environmental signals and send output signals that can be detected and serve diagnostic purposes. Microbe cohorts have been used. Cells use interacting genes and proteins, which are called gene circuits, to implement diverse function, such as responding to environmental signals, decision making and communication. Three key components are involved: DNA, RNA and Synthetic biologist designed gene circuits that can control gene expression from several levels including transcriptional, post-transcriptional and translational levels. Traditional metabolic engineering has been bolstered by the introduction of combinations of foreign genes and optimization by directed evolution. This includes engineering E. coli and yeast for commercial production of a precursor of the antimalarial drug, Artemisinin. Entire organisms have yet to be created from scratch, although living cells can be transformed with new DNA. Several ways allow constructing synthetic DNA components and even entire synthetic genomes, but once the desired genetic code is obtained, it is integrated into a living cell that is expected to manifest the desired new capabilities or phenotypes while growing and thriving. Cell transformation is used to create biological circuits, which can be manipulated to yield desired outputs. By integrating synthetic biology with materials science, it would be possible to use cells as microscopic molecular foundries to produce materials with properties whose properties were genetically encoded. Re-engineering has produced Curli fibers, the amyloid component of extracellular material of biofilms, as a platform for programmable nanomaterial. These nanofibers were genetically constructed for specific functions, including adhesion to substrates, nanoparticle templating and protein immobilization. Natural proteins can be engineered, e.g., by directed evolution, novel protein structures that match or improve on the functionality of existing proteins can be produced. One group generated a helix bundle that was capable of binding oxygen with similar properties as hemoglobin, yet did not bind carbon monoxide. A similar protein structure was generated to support a variety of oxidoreductase activities. Another group generated a family of G-protein coupled receptors that could be activated by the inert small molecule clozapine-N-oxide but insensitive to the native ligand, acetylcholine. Novel functionalities or protein specificity can also be engineered using computational approaches. One study was able to use two different computational methods – a bioinformatics and molecular modeling method to mine sequence databases, and a computational enzyme design method to reprogram enzyme specificity. Both methods resulted in designed enzymes with >100 fold specificity for production of longer chain alcohols from sugar. Another common investigation is expansion of the natural set of 20 amino acids. Excluding stop codons, 61 codons have been identified, but only 20 amino acids are coded generally in all organisms. Certain codons are engineered to code for alternative amino acids including: nonstandard amino acids such as O-methyl tyrosine; or exogenous amino acids such as 4-fluorophenylalanine. Typically, these projects make use of re-coded nonsense suppressor tRNA-Aminoacyl tRNA synthetase pairs from other organisms, though in most cases substantial engineering is required. Other researchers investigated protein structure and function by reducing the normal set of 20 amino acids. Limited protein sequence libraries are made by generating proteins where groups of amino acids may be replaced by a single amino acid. For instance, several non-polar amino acids within a protein can all be replaced with a single non-polar amino acid. One project demonstrated that an engineered version of Chorismate mutase still had catalytic activity when only 9 amino acids were used. Researchers and companies practice synthetic biology to synthesize industrial enzymes with high activity, optimal yields and effectiveness. These synthesized enzymes aim to improve products such as detergents and lactose-free dairy products, as well as make them more cost effective. The improvements of metabolic engineering by synthetic biology is an example of a biotechnological technique utilized in industry to discover pharmaceuticals and fermentive chemicals. Synthetic biology may investigate modular pathway systems in biochemical production and increase yields of metabolic production. Artificial enzymatic activity and subsequent effects on metabolic reaction rates and yields may develop "efficient new strategies for improving cellular properties ... for industrially important biochemical production". Scientists can encode digital information onto a single strand of synthetic DNA. In 2012, George M. Church encoded one of his books about synthetic biology in DNA. The 5.3 Mb of data was more than 1000 times greater than the previous largest amount of information to be stored in synthesized DNA. A similar project encoded the complete sonnets of William Shakespeare in DNA. Many technologies have been developed for incorporating unnatural nucleotides and amino acids into nucleic acids and proteins, both in vitro and in vivo. For example, in May 2014, researchers announced that they had successfully introduced two new artificial nucleotides into bacterial DNA. By including individual artificial nucleotides in the culture media, they were able to exchange the bacteria 24 times; they did not generate mRNA or proteins able to use the artificial nucleotides. Synthetic biology raised NASA's interest as it could help to produce resources for astronauts from a restricted portfolio of compounds sent from Earth. On Mars, in particular, synthetic biology could lead to production processes based on local resources, making it a powerful tool in the development of manned outposts with less dependence on Earth. Gene functions in the minimal genome of the synthetic organism, Syn 3. One important topic in synthetic biology is synthetic life, that is concerned with hypothetical organisms created in vitro from biomolecules and their component materials. Synthetic life experiments attempt to either probe the origins of life, study some of the properties of life, or more ambitiously to recreate life from non-living (abiotic) components. Synthetic life biology attempts to create living organisms capable of carrying out important functions, from manufacturing pharmaceuticals to detoxifying polluted land and water. In medicine, it offers prospects of using designer biological parts as a starting point for new classes of therapies and diagnostic tools. A living "artificial cell" has been defined as a completely synthetic cell that can capture energy, maintain ion gradients, contain macromolecules as well as store information and have the ability to mutate. Nobody has been able to create such a cell. A completely synthetic bacterial chromosome was produced in 2010 by Craig Venter, and his team introduced it to genomically emptied bacterial host cells. The host cells were able to grow and replicate. The first living organism with 'artificial' expanded DNA code was presented in 2014; the team used E. coli that had its genome extracted and replaced with a chromosome with an expanded genetic code. The nucleosides added are d5SICS and dNaM. Bacteria have long been used in cancer treatment. Bifidobacterium and Clostridium selectively colonize tumors and reduce their size. Recently synthetic biologists reprogrammed bacteria to sense and respond to a particular cancer state. Most often bacteria are used to deliver a therapeutic molecule directly to the tumor to minimize off-target effects. To target the tumor cells, peptides that can specifically recognize a tumor were expressed on the surfaces of bacteria. Peptides used include an affibody molecule that specifically targets human epidermal growth factor receptor 2 and a synthetic adhsin. The other way is to allow bacteria to sense the tumor microenvironment, for example hypoxia, by building an AND logic gate into bacteria. The bacteria then only release target therapeutic molecules to the tumor through either lysis or the bacterial secretion system. Lysis has the advantage that it can stimulate the immune system and control growth. Multiple types of secretion systems can be used and other strategies as well. The system is inducible by external signals. Inducers include chemicals, electromagnetic or light waves. Multiple species and strains are applied in these therapeutics. Most commonly used bacteria are Salmonella typhimurium, Escherichia Coli, Bifidobacteria, Streptococcus, Lactobacillus, Listeria and Bacillus subtilis. Each of these species have their own property and are unique to cancer therapy in terms of tissue colonization, interaction with immune system and ease of application. The immune system plays an important role in cancer and can be harnessed to attack cancer cells. Cell-based therapies focus on immunotherapies, mostly by engineering T cells. T cell receptors were engineered and ‘trained’ to detect cancer epitopes. Chimeric antigen receptors (CARs) are composed of a fragment of an antibody fused to intracellular T cell signaling domains that can activate and trigger proliferation of the cell. A second generation CAR-based therapy was approved by FDA. Gene switches were designed to enhance safety of the treatment. Kill switches were developed to terminate the therapy should the patient show severe side effects. Mechanisms can more finely control the system and stop and reactivate it. Since the number of T-cells are important for therapy persistence and severity, growth of T-cells is also controlled to dial the effectiveness and safety of therapeutics. Although several mechanisms can improve safety and control, limitations include the difficulty of inducing large DNA circuits into the cells and risks associated with introducing foreign components, especially proteins, into cells. Synthetic biology raises ethical issues and biosecurity issues. With the exception of regulating DNA synthesis companies, however, the issues are not seen as new because they were raised during the earlier recombinant DNA and genetically modified organism (GMO) debates and extensive regulations of genetic engineering and pathogen research were in place in many jurisdictions. Ethical questions include: Who will have control and access to the products of synthetic biology, and who will gain from these innovations? Does the patent system allow patents on living organisms? Can embryos be engineered? The European Union-funded project SYNBIOSAFE has issued reports on how to manage synthetic biology. A 2007 paper identified key issues in safety, security, ethics and the science-society interface, which the project defined as public education and ongoing dialogue among scientists, businesses, government and ethicists. The key security issues that SYNBIOSAFE identified involved engaging companies that sell synthetic DNA and the biohacking community of amateur biologists. Key ethical issues concerned the creation of new life forms. A subsequent report focused on biosecurity, especially the so-called dual-use challenge. For example, while synthetic biology may lead to more efficient production of medical treatments, it may also lead to synthesis or modification of harmful pathogens (e.g., smallpox). The biohacking community remains a source of special concern, as the distributed and diffuse nature of open-source biotechnology makes it difficult to track, regulate or mitigate potential concerns over biosafety and biosecurity. COSY, another European initiative, focuses on public perception and communication. To better communicate synthetic biology and its societal ramifications to a broader public, COSY and SYNBIOSAFE published SYNBIOSAFE, a 38-minute documentary film, in October 2009. The International Association Synthetic Biology has proposed self-regulation. This proposes specific measures that the synthetic biology industry, especially DNA synthesis companies, should implement. In 2007, a group led by scientists from leading DNA-synthesis companies published a "practical plan for developing an effective oversight framework for the DNA-synthesis industry". In January 2009, the Alfred P. Sloan Foundation funded the Woodrow Wilson Center, the Hastings Center, and the J. Craig Venter Institute to examine the public perception, ethics and policy implications of synthetic biology. On July 9–10, 2009, the National Academies' Committee of Science, Technology & Law convened a symposium on "Opportunities and Challenges in the Emerging Field of Synthetic Biology". After the publication of the first synthetic genome and the accompanying media coverage about "life" being created, President Barack Obama established the Presidential Commission for the Study of Bioethical Issues to study synthetic biology. The commission convened a series of meetings, and issued a report in December 2010 titled "New Directions: The Ethics of Synthetic Biology and Emerging Technologies." The commission stated that "while Venter’s achievement marked a significant technical advance in demonstrating that a relatively large genome could be accurately synthesized and substituted for another, it did not amount to the “creation of life”. It noted that synthetic biology is an emerging field, which creates potential risks and rewards. The commission did not recommend policy or oversight changes and called for continued funding of the research and new funding for monitoring, study of emerging ethical issues and public education. Synthetic biology, as a major tool for biological advances, results in the "potential for developing biological weapons, possible unforeseen negative impacts on human health ... and any potential environmental impact". These security issues may be avoided by regulating industry uses of biotechnology through policy legislation. Federal guidelines on genetic manipulation are being proposed by "the President's Bioethics Commission ... in response to the announced creation of a self-replicating cell from a chemically synthesized genome, put forward 18 recommendations not only for regulating the science ... for educating the public". On March 13, 2012, over 100 environmental and civil society groups, including Friends of the Earth, the International Center for Technology Assessment and the ETC Group issued the manifesto The Principles for the Oversight of Synthetic Biology. This manifesto calls for a worldwide moratorium on the release and commercial use of synthetic organisms until more robust regulations and rigorous biosafety measures are established. The groups specifically call for an outright ban on the use of synthetic biology on the human genome or human microbiome. Richard Lewontin wrote that some of the safety tenets for oversight discussed in The Principles for the Oversight of Synthetic Biology are reasonable, but that the main problem with the recommendations in the manifesto is that "the public at large lacks the ability to enforce any meaningful realization of those recommendations". The hazards of synthetic biology include biosafety hazards to workers and the public, biosecurity hazards stemming from deliberate engineering of organisms to cause harm, and environmental hazards. The biosafety hazards are similar to those for existing fields of biotechnology, mainly exposure to pathogens and toxic chemicals, although novel synthetic organisms may have novel risks. For biosecurity, there is concern that synthetic or redesigned organisms could theoretically be used for bioterrorism. Potential risks include recreating known pathogens from scratch, engineering existing pathogens to be more dangerous, and engineering microbes to produce harmful biochemicals. Lastly, environmental hazards include adverse effects on biodiversity and ecosystem services, including potential changes to land use resulting from agricultural use of synthetic organisms. In general, existing hazard controls, risk assessment methodologies, and regulations developed for traditional genetically modified organisms (GMOs) are considered to be sufficient for synthetic organisms. "Extrinsic" biocontainment methods in a laboratory context include physical containment through biosafety cabinets and gloveboxes, as well as personal protective equipment. In an agricultural context they include isolation distances and pollen barriers, similar to methods for biocontainment of GMOs. Synthetic organisms may offer increased hazard control because they can be engineered with "intrinsic" biocontainment methods that limit their growth in an uncontained environment, or prevent horizontal gene transfer to natural organisms. Examples of intrinsic biocontainment include auxotrophy, biological kill switches, inability of the organism to replicate or to pass modified or synthetic genes to offspring, and the use of xenobiological organisms using alternative biochemistry, for example using artificial xeno nucleic acids (XNA) instead of DNA. Existing risk analysis systems for GMOs are generally considered sufficient for synthetic organisms, although there may be difficulties for an organism built "bottom-up" from individual genetic sequences. Synthetic biology generally falls under existing regulations for GMOs and biotechnology in general, and any regulations that exist for downstream commercial products, although there are generally no regulations in any jurisdiction that are specific to synthetic biology. ^ "Synthetic biology: promises and perils of modern biotechnology". Marsilius Academy Heidelberg – Summer school. Heidelberg University. Retrieved 2014-09-11. ^ Nakano T, Eckford AW, Haraguchi T (12 September 2013). Molecular Communication. Cambridge University Press. ISBN 978-1-107-02308-6. ^ "Registry of Standard Biological Parts". Retrieved 2014-09-11. ^ Hayden EC (January 2014). "Synthetic-biology firms shift focus". Nature. 505 (7485): 598. Bibcode:2014Natur.505..598C. doi:10.1038/505598a. PMID 24476868. ^ Osbourn AE, O'Maille PE, Rosser SJ, Lindsey K (November 2012). "Synthetic biology. 4th New Phytologist Workshop, Bristol, UK, June 2012". The New Phytologist. 196 (3): 671–7. doi:10.1111/j.1469-8137.2012.04374.x. PMID 23043589. ^ Schwille P (September 2011). "Bottom-up synthetic biology: engineering in a tinkerer's world". Science. 333 (6047): 1252–4. Bibcode:2011Sci...333.1252S. doi:10.1126/science.1211701. PMID 21885774. ^ Noireaux V, Libchaber A (December 2004). "A vesicle bioreactor as a step toward an artificial cell assembly". Proceedings of the National Academy of Sciences of the United States of America. 101 (51): 17669–74. Bibcode:2004PNAS..10117669N. doi:10.1073/pnas.0408236101. PMC 539773. PMID 15591347. ^ Hodgman CE, Jewett MC (May 2012). "Cell-free synthetic biology: thinking outside the cell". Metabolic Engineering. 14 (3): 261–9. doi:10.1016/j.ymben.2011.09.002. PMC 3322310. PMID 21946161. ^ Elani Y, Law RV, Ces O (June 2015). "Protein synthesis in artificial cells: using compartmentalisation for spatial organisation in vesicle bioreactors". Physical Chemistry Chemical Physics. 17 (24): 15534–7. Bibcode:2015PCCP...1715534E. doi:10.1039/C4CP05933F. PMID 25932977. ^ Elani Y, Trantidou T, Wylie D, Dekker L, Polizzi K, Law RV, Ces O (March 2018). "Constructing vesicle-based artificial cells with embedded living cells as organelle-like modules". Scientific Reports. 8 (1): 4564. Bibcode:2018NatSR...8.4564E. doi:10.1038/s41598-018-22263-3. PMC 5852042. PMID 29540757. ^ Lentini R, Martín NY, Forlin M, Belmonte L, Fontana J, Cornella M, Martini L, Tamburini S, Bentley WE, Jousson O, Mansy SS (February 2017). "Two-Way Chemical Communication between Artificial and Natural Cells". ACS Central Science. 3 (2): 117–123. doi:10.1021/acscentsci.6b00330. PMC 5324081. PMID 28280778. ^ Leduc S (1912). Poinat A (ed.). La biologie synthétique, étude de biophysique. ^ Dirk Stemerding, Virgil Rerimassie (2013). Discourses on Synthetic Biology in Europe. The Hague: Rathenau Instituut. p. 4. ^ "Panel discussion". Proceedings of the Eighteenth Annual "OHOLO" Biological Conference on Strategies for the Control of Gene Expression held March 27·30, 1973, at Zichron Yaakov, Israel. Advances in Experimental Medicine and Biology. Advances in Experimental Medicine and Biology, v. 44. 1974. p. 405. CiteSeerX 10.1.1.612.3122. doi:10.1007/978-1-4684-3246-6. ISBN 978-1-4684-3248-0. ^ Szybalski W, Skalka A (November 1978). "Nobel prizes and restriction enzymes". Gene. 4 (3): 181–2. doi:10.1016/0378-1119(78)90016-1. PMID 744485. ^ a b Elowitz MB, Leibler S (January 2000). "A synthetic oscillatory network of transcriptional regulators". Nature. 403 (6767): 335–8. doi:10.1038/35002125. PMID 10659856. ^ a b Gardner TS, Cantor CR, Collins JJ (January 2000). "Construction of a genetic toggle switch in Escherichia coli". Nature. 403 (6767): 339–42. doi:10.1038/35002131. PMID 10659857. ^ ETH Zurich (1 April 2019). "First bacterial genome created entirely with a computer". EurekAlert!. Retrieved 2 April 2019. ^ Venetz, Jonathan E.; et al. (1 April 2019). "Chemical synthesis rewriting of a bacterial genome to achieve design flexibility and biological functionality". Proceedings of the National Academy of Sciences of the United States of America. doi:10.1073/pnas.1818259116. Retrieved 2 April 2019. ^ Zeng, Jie (Bangzhe). "On the concept of systems bio-engineering". Coomunication on Transgenic Animals, June 1994, CAS, PRC. 6. ^ Chopra, Paras; Akhil Kamma. "Engineering life through Synthetic Biology". In Silico Biology. 6. ^ Channon K, Bromley EH, Woolfson DN (August 2008). "Synthetic biology through biomolecular design and engineering". Current Opinion in Structural Biology. 18 (4): 491–8. doi:10.1016/j.sbi.2008.06.006. PMID 18644449. ^ Stone, M (2006). "Life Redesigned to Suit the Engineering Crowd" (PDF). Microbe. 1 (12): 566–570. ^ Baker D, Church G, Collins J, Endy D, Jacobson J, Keasling J, Modrich P, Smolke C, Weiss R (June 2006). "Engineering life: building a fab for biology". Scientific American. 294 (6): 44–51. Bibcode:2006SciAm.294f..44B. doi:10.1038/scientificamerican0606-44. PMID 16711359. ^ Kosuri S, Church GM (May 2014). "Large-scale de novo DNA synthesis: technologies and applications". Nature Methods. 11 (5): 499–507. doi:10.1038/nmeth.2918. PMID 24781323. ^ Blight KJ, Kolykhalov AA, Rice CM (December 2000). "Efficient initiation of HCV RNA replication in cell culture". Science. 290 (5498): 1972–4. Bibcode:2000Sci...290.1972B. doi:10.1126/science.290.5498.1972. PMID 11110665. ^ Couzin J (July 2002). "Virology. Active poliovirus baked from scratch". Science. 297 (5579): 174–5. doi:10.1126/science.297.5579.174b. PMID 12114601. ^ Smith HO, Hutchison CA, Pfannkoch C, Venter JC (December 2003). "Generating a synthetic genome by whole genome assembly: phiX174 bacteriophage from synthetic oligonucleotides". Proceedings of the National Academy of Sciences of the United States of America. 100 (26): 15440–5. Bibcode:2003PNAS..10015440S. doi:10.1073/pnas.2237126100. PMC 307586. PMID 14657399. ^ Wade, Nicholas (2007-06-29). "Scientists Transplant Genome of Bacteria". The New York Times. ISSN 0362-4331. Retrieved 2007-12-28. ^ Gibson DG, Benders GA, Andrews-Pfannkoch C, Denisova EA, Baden-Tillson H, Zaveri J, Stockwell TB, Brownley A, Thomas DW, Algire MA, Merryman C, Young L, Noskov VN, Glass JI, Venter JC, Hutchison CA, Smith HO (February 2008). "Complete chemical synthesis, assembly, and cloning of a Mycoplasma genitalium genome". Science. 319 (5867): 1215–20. Bibcode:2008Sci...319.1215G. doi:10.1126/science.1151721. PMID 18218864. ^ Ball, Philip (2016). "Man Made: A History of Synthetic Life". Distillations. 2 (1): 15–23. Retrieved 22 March 2018. ^ Pollack, Andrew (2007-09-12). "How Do You Like Your Genes? Biofabs Take Orders". The New York Times. ISSN 0362-4331. Retrieved 2007-12-28. ^ "Synthetic Biology Projects". arep.med.harvard.edu. Retrieved 2018-02-17. ^ Forster AC, Church GM (2006-08-22). "Towards synthesis of a minimal cell". Molecular Systems Biology. 2 (1): 45. doi:10.1038/msb4100090. PMC 1681520. PMID 16924266. ^ a b Basulto, Dominic (November 4, 2015). "Everything you need to know about why CRISPR is such a hot technology". Washington Post. Retrieved 5 December 2015. ^ Kahn, Jennifer (November 9, 2015). "The Crispr Quandary". New York Times. Retrieved 5 December 2015. ^ Ledford, Heidi (June 3, 2015). "CRISPR, the disruptor". Nature. Nature News. Retrieved 5 December 2015. ^ Higginbotham, Stacey (4 December 2015). "Top VC Says Gene Editing Is Riskier Than Artificial Intelligence". Fortune. Retrieved 5 December 2015. ^ Rollie; et al. (2012). "Designing biological systems: Systems Engineering meets Synthetic Biology". Chemical Engineering Science. 69 (1): 1–29. doi:10.1016/j.ces.2011.10.068. ^ Elani Y (June 2016). "Construction of membrane-bound artificial cells using microfluidics: a new frontier in bottom-up synthetic biology". Biochemical Society Transactions. 44 (3): 723–30. doi:10.1042/BST20160052. PMC 4900754. PMID 27284034. ^ Gach PC, Iwai K, Kim PW, Hillson NJ, Singh AK (October 2017). "Droplet microfluidics for synthetic biology". Lab on a Chip. 17 (20): 3388–3400. doi:10.1039/C7LC00576H. PMID 28820204. ^ Vinuselvi P, Park S, Kim M, Park JM, Kim T, Lee SK (2011-06-03). "Microfluidic technologies for synthetic biology". International Journal of Molecular Sciences. 12 (6): 3576–93. doi:10.3390/ijms12063576. PMC 3131579. PMID 21747695. ^ a b Freemont PS, Kitney RI (2012). Synthetic Biology – A Primer. World Scientific. doi:10.1142/p837. ISBN 978-1-84816-863-3. ^ Knight T (2003). "Tom Knight (2003). Idempotent Vector Design for Standard Assembly of Biobricks". hdl:1721.1/21168. ^ Woolfson DN, Bartlett GJ, Bruning M, Thomson AR (August 2012). "New currency for old rope: from coiled-coil assemblies to α-helical barrels". Current Opinion in Structural Biology. 22 (4): 432–41. doi:10.1016/j.sbi.2012.03.002. PMID 22445228. ^ Dueber JE, Wu GC, Malmirchegini GR, Moon TS, Petzold CJ, Ullal AV, Prather KL, Keasling JD (August 2009). "Synthetic protein scaffolds provide modular control over metabolic flux". Nature Biotechnology. 27 (8): 753–9. doi:10.1038/nbt.1557. PMID 19648908. ^ Reddington SC, Howarth M (December 2015). "Secrets of a covalent interaction for biomaterials and biotechnology: SpyTag and SpyCatcher". Current Opinion in Chemical Biology. 29: 94–9. doi:10.1016/j.cbpa.2015.10.002. PMID 26517567. ^ Bayle JH, Grimley JS, Stankunas K, Gestwicki JE, Wandless TJ, Crabtree GR (January 2006). "Rapamycin analogs with differential binding specificity permit orthogonal control of protein activity". Chemistry & Biology. 13 (1): 99–107. doi:10.1016/j.chembiol.2005.10.017. PMID 16426976. ^ Altszyler E, Ventura A, Colman-Lerner A, Chernomoretz A (October 2014). "Impact of upstream and downstream constraints on a signaling module's ultrasensitivity". Physical Biology. 11 (6): 066003. Bibcode:2014PhBio..11f6003A. doi:10.1088/1478-3975/11/6/066003. PMC 4233326. PMID 25313165. ^ Altszyler E, Ventura AC, Colman-Lerner A, Chernomoretz A (2017). "Ultrasensitivity in signaling cascades revisited: Linking local and global ultrasensitivity estimations". PLOS One. 12 (6): e0180083. arXiv:1608.08007. Bibcode:2017PLoSO..1280083A. doi:10.1371/journal.pone.0180083. PMC 5491127. PMID 28662096. ^ Kaznessis YN (November 2007). "Models for synthetic biology". BMC Systems Biology. 1 (1): 47. doi:10.1186/1752-0509-1-47. PMC 2194732. PMID 17986347. ^ Tuza ZA, Singhal V, Kim J, Murray RM (December 2013). "An in silico modeling toolbox for rapid prototyping of circuits in a biomolecular "breadboard" system.". 52nd IEEE Conference on Decision and Control. doi:10.1109/CDC.2013.6760079. ^ Khalil AS, Lu TK, Bashor CJ, Ramirez CL, Pyenson NC, Joung JK, Collins JJ (August 2012). "A synthetic biology framework for programming eukaryotic transcription functions". Cell. 150 (3): 647–58. doi:10.1016/j.cell.2012.05.045. PMC 3653585. PMID 22863014. ^ Singh V (December 2014). "Recent advances and opportunities in synthetic logic gates engineering in living cells". Systems and Synthetic Biology. 8 (4): 271–82. doi:10.1007/s11693-014-9154-6. PMC 4571725. PMID 26396651. ^ Purcell O, Lu TK (October 2014). "Synthetic analog and digital circuits for cellular computation and memory". Current Opinion in Biotechnology. Cell and Pathway Engineering. 29: 146–55. doi:10.1016/j.copbio.2014.04.009. PMC 4237220. PMID 24794536. ^ Daniel R, Rubens JR, Sarpeshkar R, Lu TK (May 2013). "Synthetic analog computation in living cells". Nature. 497 (7451): 619–23. Bibcode:2013Natur.497..619D. doi:10.1038/nature12148. PMID 23676681. ^ Rinaudo K, Bleris L, Maddamsetti R, Subramanian S, Weiss R, Benenson Y (July 2007). "A universal RNAi-based logic evaluator that operates in mammalian cells". Nature Biotechnology. 25 (7): 795–801. doi:10.1038/nbt1307. PMID 17515909. ^ Xie Z, Wroblewska L, Prochazka L, Weiss R, Benenson Y (September 2011). "Multi-input RNAi-based logic circuit for identification of specific cancer cells". Science. 333 (6047): 1307–11. Bibcode:2011Sci...333.1307X. doi:10.1126/science.1205527. PMID 21885784. ^ Nielsen AA, Der BS, Shin J, Vaidyanathan P, Paralanov V, Strychalski EA, Ross D, Densmore D, Voigt CA (April 2016). "Genetic circuit design automation". Science. 352 (6281): aac7341. doi:10.1126/science.aac7341. PMID 27034378. ^ Weinberg BH, Pham NT, Caraballo LD, Lozanoski T, Engel A, Bhatia S, Wong WW (May 2017). "Large-scale design of robust genetic circuits with multiple inputs and outputs for mammalian cells". Nature Biotechnology. 35 (5): 453–462. doi:10.1038/nbt.3805. PMC 5423837. PMID 28346402. ^ de Almeida PE, van Rappard JR, Wu JC (September 2011). "In vivo bioluminescence for tracking cell fate and function". American Journal of Physiology. Heart and Circulatory Physiology. 301 (3): H663–71. doi:10.1152/ajpheart.00337.2011. PMC 3191083. PMID 21666118. ^ Close DM, Xu T, Sayler GS, Ripp S (2011). "In vivo bioluminescent imaging (BLI): noninvasive visualization and interrogation of biological processes in living animals". Sensors. 11 (1): 180–206. doi:10.3390/s110100180. PMC 3274065. PMID 22346573. ^ Gibbs WW (1997). "Critters on a Chip". Scientific American. Retrieved 2 Mar 2009. ^ Danino T, Prindle A, Kwong GA, Skalak M, Li H, Allen K, Hasty J, Bhatia SN (May 2015). "Programmable probiotics for detection of cancer in urine". Science Translational Medicine. 7 (289): 289ra84. doi:10.1126/scitranslmed.aaa3519. PMC 4511399. PMID 26019220. ^ Westfall PJ, Pitera DJ, Lenihan JR, Eng D, Woolard FX, Regentin R, Horning T, Tsuruta H, Melis DJ, Owens A, Fickes S, Diola D, Benjamin KR, Keasling JD, Leavell MD, McPhee DJ, Renninger NS, Newman JD, Paddon CJ (January 2012). "Production of amorphadiene in yeast, and its conversion to dihydroartemisinic acid, precursor to the antimalarial agent artemisinin". Proceedings of the National Academy of Sciences of the United States of America. 109 (3): E111–8. Bibcode:2012PNAS..109E.111W. doi:10.1073/pnas.1110740109. PMC 3271868. PMID 22247290. ^ Connor, Steve (28 March 2014). "Eureka! Scientists unveil giant leap towards synthetic life". The Independent. Retrieved 2015-08-06. ^ Nguyen PQ, Botyanszki Z, Tay PK, Joshi NS (September 2014). "Programmable biofilm-based materials from engineered curli nanofibres". Nature Communications. 5: 4945. Bibcode:2014NatCo...5E4945N. doi:10.1038/ncomms5945. PMID 25229329. ^ Kuhlman B, Dantas G, Ireton GC, Varani G, Stoddard BL, Baker D (November 2003). "Design of a novel globular protein fold with atomic-level accuracy". Science. 302 (5649): 1364–8. Bibcode:2003Sci...302.1364K. doi:10.1126/science.1089427. PMID 14631033. ^ Koder RL, Anderson JL, Solomon LA, Reddy KS, Moser CC, Dutton PL (March 2009). "Design and engineering of an O(2) transport protein". Nature. 458 (7236): 305–9. Bibcode:2009Natur.458..305K. doi:10.1038/nature07841. PMC 3539743. PMID 19295603. ^ Farid TA, Kodali G, Solomon LA, Lichtenstein BR, Sheehan MM, Fry BA, Bialas C, Ennist NM, Siedlecki JA, Zhao Z, Stetz MA, Valentine KG, Anderson JL, Wand AJ, Discher BM, Moser CC, Dutton PL (December 2013). "Elementary tetrahelical protein design for diverse oxidoreductase functions". Nature Chemical Biology. 9 (12): 826–833. doi:10.1038/nchembio.1362. PMC 4034760. PMID 24121554. ^ Armbruster BN, Li X, Pausch MH, Herlitze S, Roth BL (March 2007). "Evolving the lock to fit the key to create a family of G protein-coupled receptors potently activated by an inert ligand". Proceedings of the National Academy of Sciences of the United States of America. 104 (12): 5163–8. Bibcode:2007PNAS..104.5163A. doi:10.1073/pnas.0700293104. PMC 1829280. PMID 17360345. ^ Mak WS, Tran S, Marcheschi R, Bertolani S, Thompson J, Baker D, Liao JC, Siegel JB (November 2015). "Integrative genomic mining for enzyme function to enable engineering of a non-natural biosynthetic pathway". Nature Communications. 6: 10005. doi:10.1038/ncomms10005. PMC 4673503. PMID 26598135. ^ Wang Q, Parrish AR, Wang L (March 2009). "Expanding the genetic code for biological studies". Chemistry & Biology. 16 (3): 323–36. doi:10.1016/j.chembiol.2009.03.001. PMC 2696486. PMID 19318213. ^ Davidson, AR; Lumb, KJ; Sauer, RT (1995). "Cooperatively folded proteins in random sequence libraries". Nature Structural Biology. 2 (10): 856–864. doi:10.1038/nsb1095-856. ^ Kamtekar S, Schiffer JM, Xiong H, Babik JM, Hecht MH (December 1993). "Protein design by binary patterning of polar and nonpolar amino acids". Science. 262 (5140): 1680–5. Bibcode:1993Sci...262.1680K. doi:10.1126/science.8259512. PMID 8259512. ^ Walter KU, Vamvaca K, Hilvert D (November 2005). "An active enzyme constructed from a 9-amino acid alphabet". The Journal of Biological Chemistry. 280 (45): 37742–6. doi:10.1074/jbc.M507210200. PMID 16144843. ^ "Synthetic Biology Applications". www.thermofisher.com. Retrieved 2015-11-12. ^ Liu Y, Shin HD, Li J, Liu L (February 2015). "Toward metabolic engineering in the context of system biology and synthetic biology: advances and prospects". Applied Microbiology and Biotechnology. 99 (3): 1109–18. doi:10.1007/s00253-014-6298-y. PMID 25547833. ^ Church GM, Gao Y, Kosuri S (September 2012). "Next-generation digital information storage in DNA". Science. 337 (6102): 1628. Bibcode:2012Sci...337.1628C. doi:10.1126/science.1226355. PMID 22903519. ^ "Huge amounts of data can be stored in DNA". Sky News. 23 January 2013. Archived from the original on 2016-05-31. Retrieved 24 January 2013. ^ Pollack, Andrew (May 7, 2014). "Researchers Report Breakthrough in Creating Artificial Genetic Code". New York Times. Retrieved May 7, 2014. ^ Callaway, Ewen (May 7, 2014). "First life with 'alien' DNA". Nature. doi:10.1038/nature.2014.15179. Retrieved May 7, 2014. ^ a b Malyshev DA, Dhami K, Lavergne T, Chen T, Dai N, Foster JM, Corrêa IR, Romesberg FE (May 2014). "A semi-synthetic organism with an expanded genetic alphabet". Nature. 509 (7500): 385–8. Bibcode:2014Natur.509..385M. doi:10.1038/nature13314. PMC 4058825. PMID 24805238. ^ a b Verseux, C.; Paulino-Lima, I.; Baque, M.; Billi, D.; Rothschild, L. (2016). Synthetic Biology for Space Exploration: Promises and Societal Implications. Ambivalences of Creating Life. Societal and Philosophical Dimensions of Synthetic Biology, Publisher: Springer-Verlag. Ethics of Science and Technology Assessment. 45. pp. 73–100. doi:10.1007/978-3-319-21088-9_4. ISBN 978-3-319-21087-2. ^ Menezes, A; Cumbers, J; Hogan, J; Arkin, A (2014). "Towards synthetic biological approaches to resource utilization on space missions". Journal of the Royal Society, Interface. 12. ^ Montague M, McArthur GH, Cockell CS, Held J, Marshall W, Sherman LA, Wang N, Nicholson WL, Tarjan DR, Cumbers J (December 2012). "The role of synthetic biology for in situ resource utilization (ISRU)". Astrobiology. 12 (12): 1135–42. Bibcode:2012AsBio..12.1135M. doi:10.1089/ast.2012.0829. PMID 23140229. ^ Hutchison CA, Chuang RY, Noskov VN, Assad-Garcia N, Deerinck TJ, Ellisman MH, Gill J, Kannan K, Karas BJ, Ma L, Pelletier JF, Qi ZQ, Richter RA, Strychalski EA, Sun L, Suzuki Y, Tsvetanova B, Wise KS, Smith HO, Glass JI, Merryman C, Gibson DG, Venter JC (March 2016). "Design and synthesis of a minimal bacterial genome". Science. 351 (6280): aad6253. Bibcode:2016Sci...351.....H. doi:10.1126/science.aad6253. PMID 27013737. ^ a b Connor, Steve (1 December 2014). "Major synthetic life breakthrough as scientists make the first artificial enzymes". The Independent. London. Retrieved 2015-08-06. ^ a b Deamer D (July 2005). "A giant step towards artificial life?". Trends in Biotechnology. 23 (7): 336–8. doi:10.1016/j.tibtech.2005.05.008. PMID 15935500. ^ Gibson DG, Glass JI, Lartigue C, Noskov VN, Chuang RY, Algire MA, Benders GA, Montague MG, Ma L, Moodie MM, Merryman C, Vashee S, Krishnakumar R, Assad-Garcia N, Andrews-Pfannkoch C, Denisova EA, Young L, Qi ZQ, Segall-Shapiro TH, Calvey CH, Parmar PP, Hutchison CA, Smith HO, Venter JC (July 2010). "Creation of a bacterial cell controlled by a chemically synthesized genome". Science. 329 (5987): 52–6. Bibcode:2010Sci...329...52G. doi:10.1126/science.1190719. PMID 20488990. ^ "Scientists Reach Milestone On Way To Artificial Life". 2010-05-20. Retrieved 2010-06-09. ^ Venter, JC. "From Designing Life to Prolonging Healthy Life". YouTube. University of California Television (UCTV). Retrieved 1 February 2017. ^ Zu C, Wang J (August 2014). "Tumor-colonizing bacteria: a potential tumor targeting therapy". Critical Reviews in Microbiology. 40 (3): 225–35. doi:10.3109/1040841X.2013.776511. PMID 23964706. ^ Gujrati V, Kim S, Kim SH, Min JJ, Choy HE, Kim SC, Jon S (February 2014). "Bioengineered bacterial outer membrane vesicles as cell-specific drug-delivery vehicles for cancer therapy". ACS Nano. 8 (2): 1525–37. doi:10.1021/nn405724x. PMID 24410085. ^ Piñero-Lambea C, Bodelón G, Fernández-Periáñez R, Cuesta AM, Álvarez-Vallina L, Fernández LÁ (April 2015). "Programming controlled adhesion of E. coli to target surfaces, cells, and tumors with synthetic adhesins". ACS Synthetic Biology. 4 (4): 463–73. doi:10.1021/sb500252a. PMC 4410913. PMID 25045780. ^ Rice KC, Bayles KW (2008) Molecular control of bacterial death and lysis. Microbiol Mol Biol Rev 72: 85–109. ^ Ganai, S., Arenas, R. B. & Forbes, N. S. Tumour-targeted delivery of TRAIL using Salmonella typhimurium enhances breast cancer survival in mice. Br. J. Cancer 101, 1683–1691 (2009). ^ Jones, B.S., Lamb, L.S., Goldman, F. & Di Stasi, A. Improving the safety of cell therapy products by suicide gene transfer. Front. Pharmacol. 5, 254 (2014). ^ Wei P, Wong WW, Park JS, Corcoran EE, Peisajovich SG, Onuffer JJ, Weiss A, LiWA. 2012. Bacterial virulence proteins as tools to rewire kinase pathways in yeast and immune cells. Nature 488: 384–388. ^ Danino, T., Mondragon-Palomino, O., Tsimring, L. & Hasty, J. A synchronized quorum of genetic clocks. Nature 463, 326–330 (2010). ^ a b Bügl H, Danner JP, Molinari RJ, Mulligan JT, Park HO, Reichert B, Roth DA, Wagner R, Budowle B, Scripp RM, Smith JA, Steele SJ, Church G, Endy D (June 2007). "DNA synthesis and biological security". Nature Biotechnology. 25 (6): 627–9. doi:10.1038/nbt0607-627. PMID 17557094. ^ "Ethical Issues in Synthetic Biology: An Overview of the Debates" (PDF). ^ a b Presidential Commission for the study of Bioethical Issues, December 2010 NEW DIRECTIONS The Ethics of Synthetic Biology and Emerging Technologies Retrieved 2012-04-14. ^ Savulescu J, Pugh J, Douglas T, Gyngell C (July 2015). "The moral imperative to continue gene editing research on human embryos". Protein & Cell. 6 (7): 476–9. doi:10.1007/s13238-015-0184-y. PMC 4491050. PMID 26113289. ^ Schmidt M, Ganguli-Mitra A, Torgersen H, Kelle A, Deplazes A, Biller-Andorno N (December 2009). "A priority paper for the societal and ethical aspects of synthetic biology" (PDF). Systems and Synthetic Biology. 3 (1–4): 3–7. doi:10.1007/s11693-009-9034-7. PMC 2759426. PMID 19816794. ^ Schmidt M. Kelle A. Ganguli A, de Vriend H. (Eds.) 2009. "Synthetic Biology. The Technoscience and its Societal Consequences". Springer Academic Publishing. ^ Kelle A (December 2009). "Ensuring the security of synthetic biology-towards a 5P governance strategy". Systems and Synthetic Biology. 3 (1–4): 85–90. doi:10.1007/s11693-009-9041-8. PMC 2759433. PMID 19816803. ^ Schmidt M (June 2008). "Diffusion of synthetic biology: a challenge to biosafety" (PDF). Systems and Synthetic Biology. 2 (1–2): 1–6. doi:10.1007/s11693-008-9018-z. PMC 2671588. PMID 19003431. ^ Kronberger N, Holtz P, Kerbe W, Strasser E, Wagner W (December 2009). "Communicating Synthetic Biology: from the lab via the media to the broader public". Systems and Synthetic Biology. 3 (1–4): 19–26. doi:10.1007/s11693-009-9031-x. PMC 2759424. PMID 19816796. ^ Cserer A, Seiringer A (December 2009). "Pictures of Synthetic Biology : A reflective discussion of the representation of Synthetic Biology (SB) in the German-language media and by SB experts". Systems and Synthetic Biology. 3 (1–4): 27–35. doi:10.1007/s11693-009-9038-3. PMC 2759430. PMID 19816797. ^ Parens E., Johnston J., Moses J. Ethical Issues in Synthetic Biology. 2009. ^ a b Erickson B, Singh R, Winters P (September 2011). "Synthetic biology: regulating industry uses of new biotechnologies". Science. 333 (6047): 1254–6. Bibcode:2011Sci...333.1254E. doi:10.1126/science.1211066. PMID 21885775. ^ Howard, John; Murashov, Vladimir; Schulte, Paul (2017-01-24). "Synthetic Biology and Occupational Risk". NIOSH Science Blog. Retrieved 2018-11-30. ^ a b Howard, John; Murashov, Vladimir; Schulte, Paul (2016-10-18). "Synthetic biology and occupational risk". Journal of Occupational and Environmental Hygiene. 14 (3): 224–236. doi:10.1080/15459624.2016.1237031. ISSN 1545-9624. PMID 27754800. ^ National Academies Of Sciences, Engineering; Division on Earth Life Studies; Board On Life, Sciences; Board on Chemical Sciences Technology; Committee on Strategies for Identifying Addressing Potential Biodefense Vulnerabilities Posed by Synthetic Biology (2018-06-19). Biodefense in the Age of Synthetic Biology. National Academies of Sciences, Engineering, and Medicine. doi:10.17226/24890. ISBN 9780309465182. PMID 30629396. ^ "Future Brief: Synthetic biology and biodiversity". European Commission. September 2016. pp. 14–15. Retrieved 2019-01-14. ^ "Final opinion on synthetic biology III: Risks to the environment and biodiversity related to synthetic biology and research priorities in the field of synthetic biology". EU Directorate-General for Health and Food Safety. 2016-04-04. pp. 8, 27. Retrieved 2019-01-14. ^ a b "Opinion on synthetic biology II: Risk assessment methodologies and safety aspects". EU Directorate-General for Health and Consumers. 2016-02-12. doi:10.2772/63529. ^ Bailey, Claire; Metcalf, Heather; Crook, Brian (2012). "Synthetic biology: A review of the technology, and current and future needs from the regulatory framework in Great Britain" (PDF). UK Health and Safety Executive. Retrieved 2018-11-29. ^ Trump, Benjamin D. (2017-11-01). "Synthetic biology regulation and governance: Lessons from TAPIC for the United States, European Union, and Singapore". Health Policy. 121 (11): 1139–1146. doi:10.1016/j.healthpol.2017.07.010. ISSN 0168-8510. PMID 28807332. 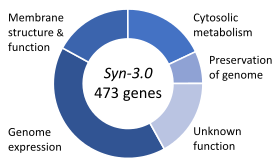 Wikimedia Commons has media related to Synthetic biology. This page was last edited on 10 April 2019, at 11:15 (UTC).